XL Editor 1.1 is now available. 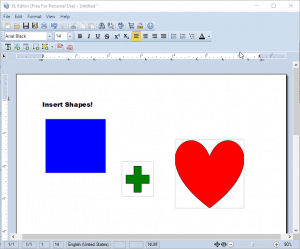 This update adds the ability to insert shapes and includes enchancements for PDF documents. XL Editor can create and edit Word documents (DOCX & DOC), PDF documents, Rich Text (RTF), Web Pages (HTML & HTM), and Plain Text (TXT). You can use it to convert both ways between Word and PDF documents . Added drag and drop support for text frames. Best of all it is 100% free for personal use! Pro version upgrade for commercial use is only $19.95.